So I was hearing about this Monopoly game organised by McDonald's as part of their promotion, which I was totally clueless. As per my earlier entry, we had Faith's birthday party at McDonald's. 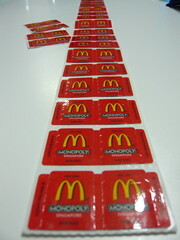 When it came to settling the bill, we were given this kan dua stack of these McDonald's Monopoly peel-away thingies which I saw for the very first time. To be honest, I still don't know how this game works and it certainly doesn't look very interesting. So out of boredom, I decided to just open them to see what is inside. HOW COME ALL SENTOSA COVE ONE??!! FAKE FAKE FAKE.. you want ppl to come to your blog when they google for sentosa cove right.. lol..
next time got such game, really should just organise an event.. then i dont need to eat mac until i am so sibeh sianz..
ChocolateGal: But that's the whole point of this promotion. To get more people to eat more McDonald's. Bleah! naiveguy: Your comment and your nick just made it all the more funnier! so how many fwee burgers u have le? Aloe:: Don't have lah.... all of them Sentosa Cove how to exchange for burgers? Ahtiong73: Can't. Wife hijacked the whole stack.